The above quote was the last notation made by a friend of mine as 2015 rolled over into 2016. A year later, I can’t help but recall his statement as I ponder what 2017 will hold for me. You are the writer of your own year. You have started a new book and each day offers you a chance to further your story . . . and your personal development. Perhaps you are like me and are looking at a blank page. Suffering from writer’s block as you try to work out the plot line for your next 365 days. Or you may have it outline, charted and ready to go long before the ball dropped this past weekend. Either way, there is a year of discovery, characters, twists and dialogue ahead for you. A year in which you have the power to chart your own path through unknown territory, encounter new friends and develop your skills for your life long journey. Your book starts now. I wish you the best in your upcoming story. With that, I would also like to take a moment to remind you that Morningstars Toastmasters weekly 7am Wednesday morning meetings at Harmony Hall in Lower Gibsons resume on January 4th. See you there! The Morningstars Toastmasters Club spring contests will be held on March 29, 2017. The event will include the International Speech and Evaluation contests. As a friendly reminder, here are the basic rules for each contest. For further information, please visit our Contest 101 under Resources at the top of the page AND download the 2016-2017 Speech Contest Rulebook. Be a paid member of the club, area, division, district in which you are competing. This morning our Chair, Sheila Cameron, came to me and asked if there was anything she could help me with as General Evaluator, particularly in connecting with the Speech Evaluators. Hmmmmm, it hadn’t occurred to me to speak to them even though the General Evaluator evaluates speech evaluators. I promptly got to my feet and went to both speech evaluators. I asked in turn if there was anything I could do to help them in their role or anything I could watch for. Johanna asked me to watch for how she listened and gave positive feedback. Patricia asked me to watch to see if her evaluation was balanced between positive observation and constructive feedback. With both Johanna and Patricia, it was clear they’d asked the speaker they were evaluating if there was anything in particular they wanted feedback on. Now let’s see, the conversation went from Sheila to me to Johanna and Patricia and finally to Jade and Haida, our two speakers. Six people were involved in the chain of communication. Right now mainstream media, alternative media, and social media are a-buzz with conflict. My side and your side. My skin colour and your skin colour. My gender identity and your gender identity. My opinion (I’m right!) and your opinion (you’re wrong and why can’t you see that!). It seems to me that Toastmasters celebrates individual achievement and, at the same time, embodies the concept that we’re all in this together. I might not agree with your idea, but that doesn’t mean I can’t be friends with you. It doesn’t mean that if I oppose what you say my only response is anger. What happened in our meeting this morning was not an event that was uncharacteristic for Morningstars. Rather, it’s the ongoing tone of our club and we are blessed that it is so. This simple question is a model that could transform all world systems. Members can plan for and deliver longer, varying type speeches such as Panel Discussions, Oratory speeches or even Roasting speeches from the advanced manuals. Not only are you able to deliver the longer format speeches, but you are able to receive the right type and more intensive evaluations for these speeches in return. After completing the CC manual, many members “major” in areas of their choice. Some like the analytical side of facilitating and debates. Others have chosen to perfect their craft of storytelling. Each path taken offers insights to new members and evaluations. Each has a different perspective that can help take your speeches (and evaluations) to a new level. Beachcombers offers the ambiance of a dinner meeting. We order drinks and deliver speeches while our main course is being prepared. During dinner, members have a chance to talk, interact and further their “impromptu response” skills. It’s a bit more laid back and the gentle flow of conversation adds to the ease of the meeting. 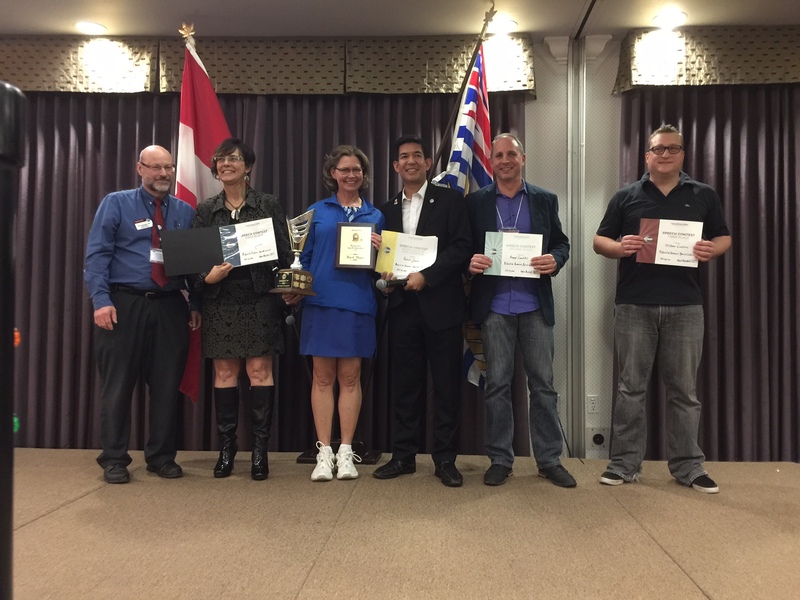 For members who are short on time and heavy on commitments, the monthly meeting schedule of the Sunshine Coast advanced Toastmasters group is the perfect opportunity to maintain skills on a lighter schedule. There will come a time when you feel like you know your audience. You know the inside jokes that will make them laugh. You know the speeches they are keen about. To challenge ourselves, we need to try something new. Every month, for one evening, I am getting up in front of a different audience. Interacting and connecting in a different way. This practice makes it easier for me to connect differently with Morningstars . . . and make new connections when I need to step up. Those are the reasons I maintain a dual membership with Toastmasters on the Coast. If you are interested in experiencing a different club, even just to see how different clubs operate, don’t hesitate to let me know. I’ll be happy to introduce you as a guest at an upcoming meeting! I’d like to share an experience I had over the weekend. I attended the District 96 Fall Conference in Burnaby. The idea started about a month ago when a note was attached to my computer monitor. It had one word on it “register”. I didn’t put it there. Despite daily questioning I ignored it. If you really knew me you would know its not easy to get me to part with money and you would know my mantra, “I can’t wait to stay home”. Now my wife may not understand Toastmasters but she does understand me, she had booked the hotel weeks ago, I was going, and she knew it, and I’m so glad I did. After check-in and registration, expertly assisted by our own Sheila C.. I, a first timer at the conference was invited to a special reception. This is where the uniquely Toastmasters experience started and never stopped. Those fears and trepidations you normally feel when entering a new venue or large gathering where never allowed to materialize, instead I felt pulled by a force that I can only describe as a mixture of enthusiasm and hospitality. I was never able to stop and think about where is was going before a handshake was offered and I was welcomed into conversation or directed to where I was going. Both Sheila and I represented our club(s) in the Banner Parade and although the awards/ribbons were earned before my time I was very proud to be carrying one of the most decorated banners in the conference. There were Keynote speakers on each of the three days, and all were very accomplished speakers with clear motivational messages. Watching them was both entertaining and a lesson in public speaking. My personal favorite was the workshop “Crafting and Delivering Compelling Stories” given by Sharookh Daroowala. If you get a chance you should attend his workshop. I don’t want to go into a chronological of the 3 days, but rather share what I thought were the overall themes and messages. The constant message all the way from Keynote speakers to people you chat with is that Toastmasters provides a supportive and positive learning experience in which members are empowered to develop and that members develop in many more ways than just public speaking. Next is that to sustain Toastmasters it takes a team. The message was clear that teamwork has never been more important, than it is this year (2017), being the Year that the world comes to Vancouver. The goal of district 96 is to be the number 1 district in the world when the World Conference comes to Vancouver. Using their catch phrase they/we want to Storm the Stage in 2017. And not only do they want support, they want everyone to join the party. It was pointed out that this will be your only chance to attend a world conference on your own turf. It’s more likely that the Olympics will come to Vancouver again in your lifetime than the T.I. World Convention. I must admit I’m excited. I’m thinking about going, but what’s more important is this Wednesday and then the next Wednesday and all my friends at Morningstars. Fall Contest Winners Are . . .
Each year, over 30,000 Toastmasters compete in the Humorous, Evaluation, Tall Tales, Table Topics and International speech contests. This week, five members of Morningstars signed up to compete in the 2016 Fall Humorous Speech and Table Topics Contest, chaired by our own Neil B. It was an exciting morning as Weegee S. shared her story of coming toe to toe with a Victoria Secret Angel, PJ R. pondered where he went wrong when his adult son didn’t feel the need to head out into the world on his own and Johanna R. took us behind the Girl Guide Cookie Sales to life at camp with Sparks. In Table Topics, Sandy W., Judy L. and Weegee S. took two minutes to speak about what it is they really want. However, the true winners of a competition are the ones who volunteer to fill roles like contest chair, chief judge, judges, timers and ballot counters. Without their manpower, 30,000 contestants a year wouldn’t be able to test their public speaking skills. Another fantastic contest is in the books! The top two winners in each contest will continue to the Area Round, which will be held at 2pm on Oct. 2nd at Davis Bay Hall. “She was like . . . And I was like . . . But we were all . . . Um . . . ” These were the highlights of an overhead conversation between two twenty-somethings on a bus. By the time we reached their stop, the amount of “ums” and “likes” each had uttered was staggering . . . triple digits. Filler words. They are something I wouldn’t have noticed in other people’s speech prior to Toastmasters. The reason? I am a closet filler user. Typically, it only comes out when I visit my mom and sister, but every once in a while my dependency on the useless words creep into my speeches. Steven D. Cohen, an award-winning speaker who leads career and academic workshops on public speaking at Harvard Extension School, believes we have been conditioned to answer questions immediately from an early age. We feel the urge to speak when spoken to. Filler words are commonly used when we begin talking and as a transition between ideas. According to Seth Godin, it’s our way to “keep making sounds in order to keep your turn as the speaker.” Or so that the other person won’t jump in the moment you pause. It’s a way of keeping the floor. At least it explains why I use it comes out with gusto around my talkative family members. How Do We Replace the “Um” and “Like”? 1) Remind yourself that the person you are talking to (or the audience) isn’t waiting to steal the microphone from you. You have the floor. 2) When practicing your speech, talk as slowly as you need to. When transitioning ideas or verbally considering your next word — PAUSE. THINK. PROCEED. 3) Eventually, your speech will get faster . . . minus the ums. Note that we aren’t “replacing” the fillers with alternate words but adding silence to your dialogue or speech. Oddly the way to move your speech forward is by not saying a word. It’s that time of year when celebrities start rocking the graduation stage, imparting their inspiring dose of wisdom on the departing class. This year’s most inspiring graduation speech is a spoken word poem delivered by the dynamic Donovan Livingston at Harvard’s Graduate School of Education on May 25, 2016. The North Carolina native student speaker graduated with a Masters in Education and used his five minutes to address issues black people face in the education system and how a teacher inspired him to find his voice, his story. The “powerful, heartfelt” (Harvard Graduate School of Education) speech was meant to illuminate the inequalities in education and how we “often laud education as this thing that is the great equalizer in our society, and it’s really not,” according to Livingston. The powerhouse speech (poem) delivers a message to empower his fellow students with the thought that they are the key to changing the system. He found a way to touch, connect and reach others via owning his own way. He gave the audience something to work towards . . . and inspiration for all Toastmasters. Find your story. Your way of putting your energy to good use. Inspire others in your unique way. Note: Thanks to Michael W. for bringing the video and the speech to my attention. Feel free to email Weegee blog ideas! Rainbows. I thought i was writing a speech on rainbows. Their colours. The myths. The magic. The more I wrote about this wondrous painting done by Mother Nature, the less I felt it was about rainbows. To Inform is primarily to convey new or existing information to the audience. This includes lectures, briefings and demonstrations. To Persuade is primarily to change the audience’s attitudes or behaviors or to convince the audience to accept or approve your point of view. Examples are sale presentations, campaign speeches and volunteer recruitment presentations. To Entertain is primarily to amuse or provide enjoyment for the audience. Humourous speeches and tall tales are examples. To Inspire is primarily to ask the audience to achieve noble goals, ideals or reach their highest potential. Their draw on emotions and sentiment, such as a commencement speech. It is possible that your speech would fit neatly into all of these categories. But what is YOUR purpose. Know your purpose will help in crafting a strong speech. As you prepare your speech, make the purpose clear to the audience. Hand them the road map as to where you are going with your talk. Knowing your speech purposes and being able to effectively organize your speech to achieve the intended purpose provides big benefits to you and your audience. Going back to the rainbows, it turns out that I was writing about rainbows. However, if I wanted to make a bigger impact, I needed to narrow my focus. Pick one thing that I wanted my audience to know after the meeting. Chose a purpose. Good Morning! Reflecting on the informative and inspiring workshops that many of us attended last weekend (Evaluation and Crafting Speeches), I have found that it offered the perfect motivation for my current stage of Toastmaster personal development. I have completed the Entertainment and Storytelling Advanced manuals and am now half-way through the Speaking to Inform. I just decided last week to postpone the Professional Speaker manual and shift gears into the Humorous Speeches. I am so ready for this adventure. All that we have learned about how audiences listen and learn from our speech delivery is building confidence to tell our stories with humour and style. My dream coming true. I even anticipate that being a professional or guest speaker one day will be a fun challenge. The workshops last weekend were timely for our up-coming speaking competition. Toastmasters is designed so well to assist us in fulfilling our storytelling dreams. Are you ready for your next Toastmaster adventure? Participate in the upcoming club level International Speech and Evaluation Contest on Wednesday, March 23 at 7am in Harmony Hall. Pit your storytelling skills against other club members or demonstrate your evaluation abilities. It is fun and a new challenge. Sign up today in Turbobase!